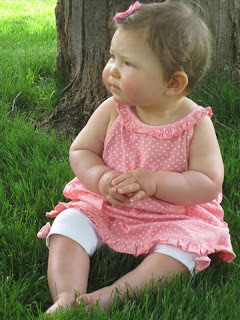 Welcome to the May Waltzingmouse Release Design Team Blog Waltz! Today both new sets, Country Labels 4 and USA 1776 are available to purchase at the WMS shop! Since we have such a large Design Team now - I was one of the DT chosen to sit out during the sneak peeks this month - I will be posting 'after the fact' retro-peeks (!) on June 6th and June 27th along with other DT members who were sitting out this month so I hope you are able to check back then for more inspiration using these two new sets! 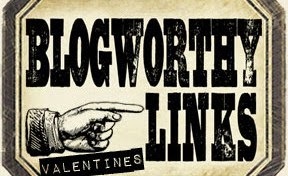 You should start today's waltz at Claire's blog. 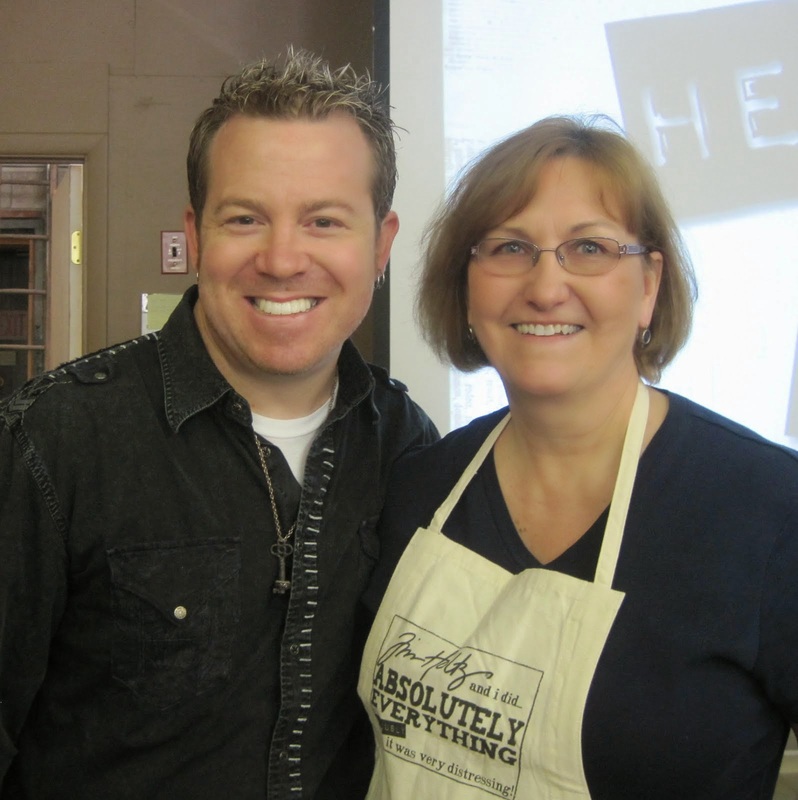 If you are coming here from Belinda's blog you are in the right place! I used the USA 1776 set for my first two samples today. 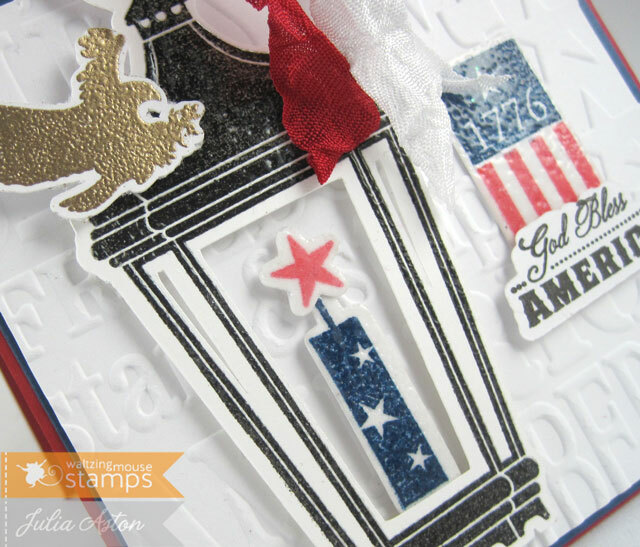 On this card - I used the cut files Claire sells in the store, stamping in colored ink and clear embossing on the flag, candle and lantern. I gold embossed the eagle. I placed the candle (fire cracker!) inside the lantern from a previous release - Bright Season. I used the free cut file of the lantern to stamp on, again embossing it in clear EP. 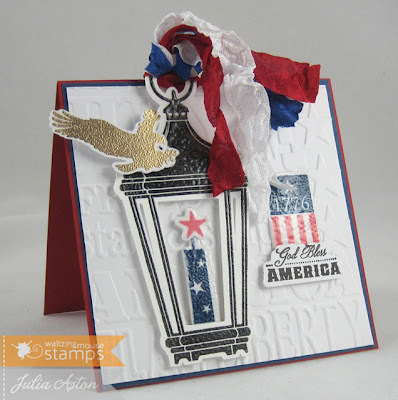 I embossed the background with the Americana Background and Borders embossing folder. I looped red, white and blue wrinkled seam tape through the loop on the lantern. Pretty much everything is up on foam tape. My card is 4 1/4" x 4 1/4". 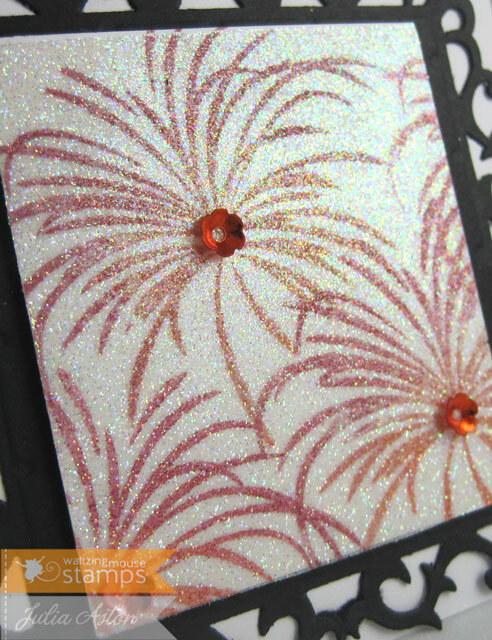 I used one of the fire works stamps on my next card - and made it a celebration card - think Birthday or Graduation! I made a glitter panel - layering a double sided sticky paper over a white card stock panel of the same size and pressing Dazzling Diamonds over the sticky top - then I stamped the images right over the glitter using red and orange Versafine pigment Ink - I found a tutorial for this here. I added some little flower sequins to the center of each 'explosion' adhering them with Glossy Accents, and framed the panel with a Spellbinders Fleur de Lis Square. It really is quite sparkly IRL! Again the size is 4 1/4" x 4 1/4". For my next two creations I used the set Country Labels 4. For project #1, I up-cycled a gift bag I received from my son on Mother's Day - the name of the shop he purchased the gift from was embossed in the center of the front and the back of the bag so I embossed one of the labels in this set in silver and die cut it with Spellbinders Labels 4 to cover that up! I made a second label for the back using the same label stamp. The For: and From: are from the set previously released - Big Day Additions. Here's a close up of the label so you can hopefully see the lovely silvery shine! 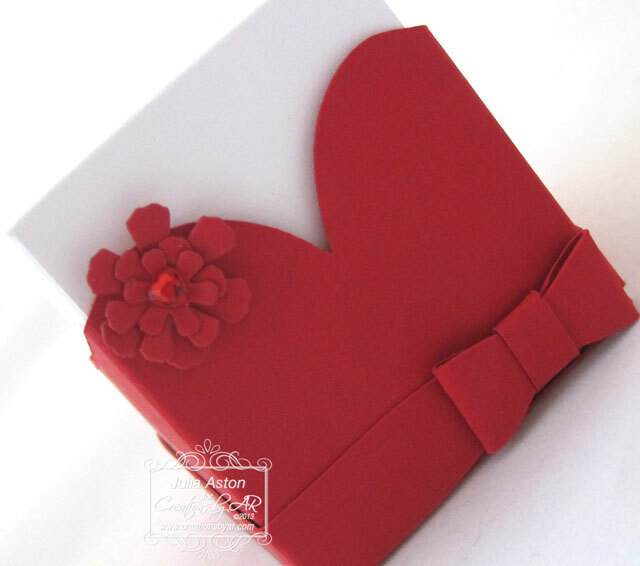 I die cut the Thank You sentiment with a Mega Deckled Rectangle from Spellbinders and layered it with foam tape. And for my final project (sorry I'm taking so much of your time!) I made a sweet little tag using the cherry, leaf and another one of the sentiments from this set. Look how nicely this cherry stamps - I inked it with the little dew drop shaped Memento inks so it was really easy to get the cherry red and the stem brown - the leaf is a separate stamp. 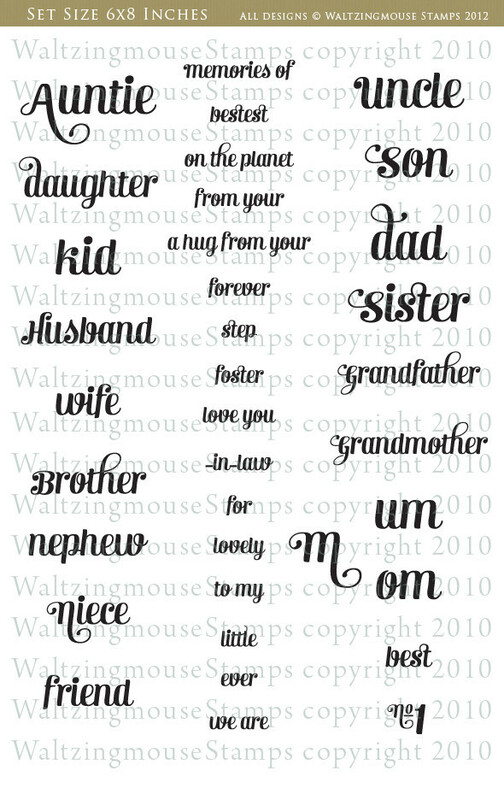 Claire has such a great mix of fonts on the sentiments in this set. As always - there will be a prize of a stamp set of choice from a random drawing from comments left on all the DT's blogs. You have until June 1st at 6:59 am EST to leave comments. 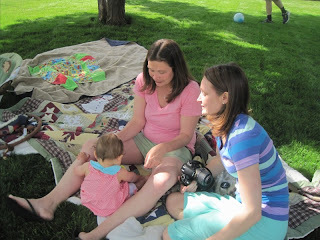 The winner will be posted on Claire’s WMS blog on June 3rd. Remember to hop over to the WMS shop and get yourself some of these new stamps! Next on the dance card is Laurie! 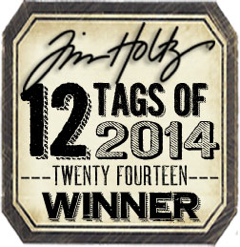 Remember to leave comments as you waltz along to increase your chances of winning a WMS stamp set! Accessories: embossing folder - Americana Background & Borders Set - Tim Holtz Texture fades, clear and gold embossing powders, foam tape, WMS Bright Season cut file, WMS USA 1776 cut files, wrinkled seam tape - Prairie Bird Boutique Etsy Shop, Silhouette Cameo. Accessories: Peel N Stick Double Sided Adhesive sheets - ThermOWeb, foam tape, Dazzling Diamonds - SU, flower sequins - Cartwiright, Glossy Accents, Fleur de lis Squares - Spellbinders. Accessories: silver embossing powder, hot gun, Labels 4 and Deckled Edge Mega Rectangles - Spellbinders Nestabilities, recycled gift bag, ScorTape. Ink: Versafine onyx black, Memento Espresso truffle, Lady Bug, Bamboo Leaves. Accessories: foam tape, twine - WMS, New Leaf Twill - PTI, circle Nestabilities, tag sale #3 die - PTI. 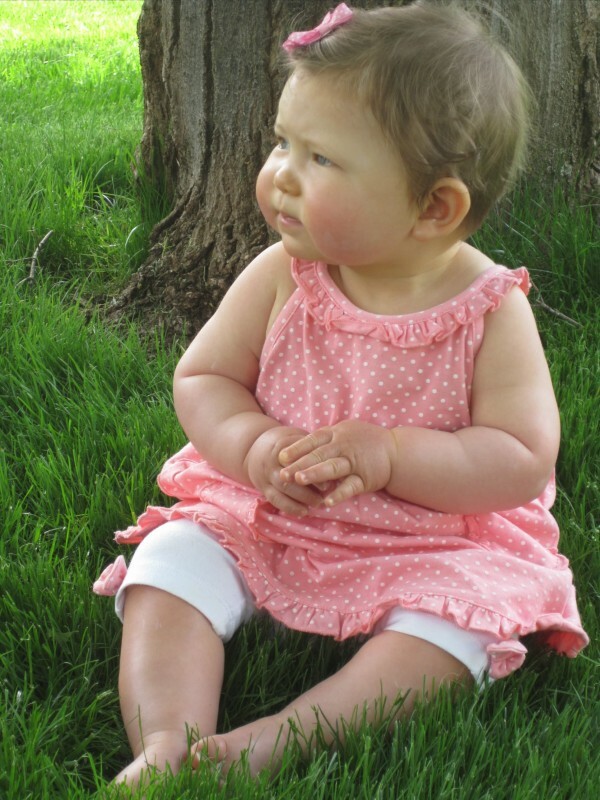 My niece Katie (the mother of my adorable grand nephew, Landon and sweet grand nice, Mila who have graced the pages of this blog quite often!) 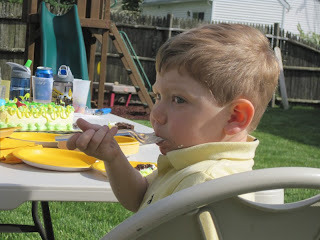 - turns 30 on 5/26, and her DH Greg had a birthday party for her this past Saturday - it was a gorgeous sunny day and they had it in their back yard with a wonderful big maple tree that shades half of the yard and a big wooden gym set for the kids to play on - so we could sit in sun or shade and watch the kids play and run around! Being this was a milestone b'day - I wanted to give her something special and wrap it in something special! So I decorated this jute bag from Pouch Mart. I die cut a piece of Natural Sticky Back Canvas with a Spellbinders Wonky Rectangle. Then I 'painted' it by pushing a piece of bubble wrap in some green and blue Acrylic Paints I spread on a piece of wax paper and dabbing the bubble wrap onto the the canvas. After it dried I glued on letters and numbers and stuck it to the bag (it has a sticky back). Not trusting that it would stay on with multiple openings and closings of the bag - I punched through the two top corners and tied it on with wrinkled seam tape (my Cropadile punches through a lot of thickness!). I also used some Scotch Quick Dry Adhesive on the bottom corners and along the sides - making sure the glue didn't run through onto the back of the bag! I added a red heart that I punched from glitter paper. Then I added a book ring on the top corner with tags stamped with words of all the things Katie is - wife, niece, friend, mum, sister, daughter, and daughter-in-law. 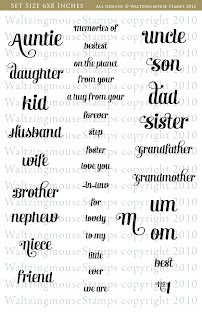 The stamp set is Compact Family from Waltzingmouse. The last tag says Happy Birthday Wishes and that's from the Compact Sentiments set. And I have to show you the special gift I bought her. It came in this lovely box with the pretty ribbon and pearl tied around it. Inside was this sterling silver bracelet with the names of her children hand stamped into the sterling silver hearts. I loved it when it came in the mail - she loved it when she opened it! I got it on line at The Vintage Pearl. 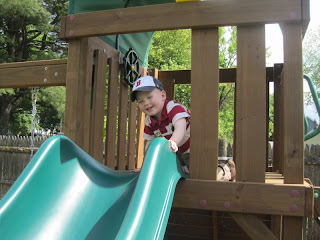 Here is James - he'll be 2 on Memorial Day this year! Here is Landon, he'll be 3 in September. and I just have to share one more pic of a side view! Look at those sweet cheeks!! Accessories: Block Alphabet and Numbers dies - PTI, Wonky Rectangle die - Spellbinders, Scotch Quick Dry Adhesive - Michaels, Martha Stewart Acrylic Paints - Summer Haze, Peas Shoot, heart punch - EK Success, Book Ring - Staples, bubble wrap from packaging in an order I received, wrinkled seam tape - Prairie Bird Boutique Etsy Shop, Cropadile, jute bag - Pouch Mart. 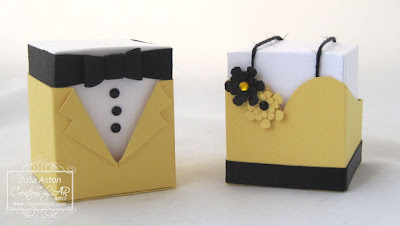 Creations by AR - May Release DT Blog Hop - Tux and Gown Box Set. 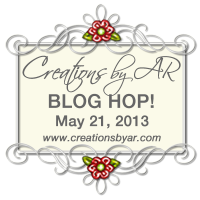 Welcome to the May Creations by AR release Design Team Blog Hop. 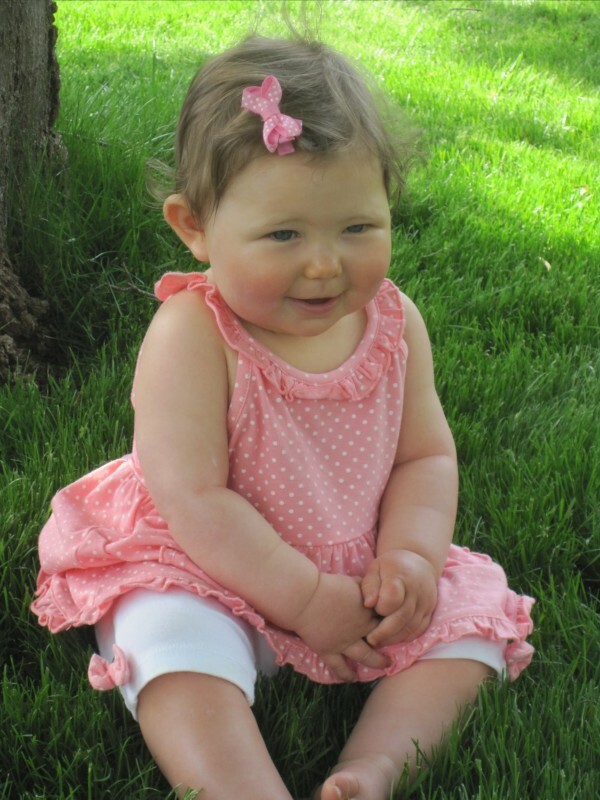 Just look at the cute template Ardela has for us this month! Just in time for the prom/wedding season! 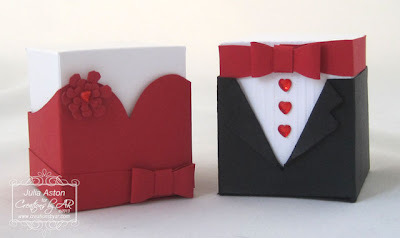 It's called Tux and Gown Box Set. All of Adela's templates come in 3 formats - PDF to print and hand cut, SVG and DXF to use with cutting machines. 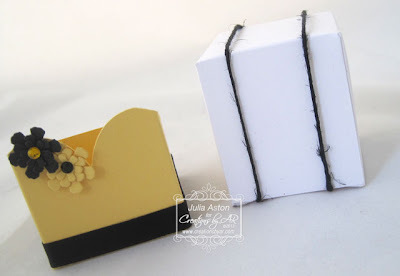 I quickly created two sets of treat boxes using the template SVG files and my Silhouette Cameo machine. For my first Tux/Gown set - I went with a sweetheart/Valentine's theme. The white part lifts out so you can put treats inside the 'boxes'. The boxes are 2 1/4" x 2" x 2". But you can re-size if you are using the SVG files. I made the ladies gown red adding a layered die cut flower with a rhinestone heart on one side and balancing it by adding the bow-tie piece along the waist. For the gentleman - I coordinated with the ladies gown by making the bow tie red and adding red heart rhinestones for buttons. The pleats are made with my Scor Pal as per Adela's instructions. Gosh, aren't these the cutest things?? I was never brave enough to wear a strapless gown (!) so I thought I'd try to add spaghetti straps to this one. 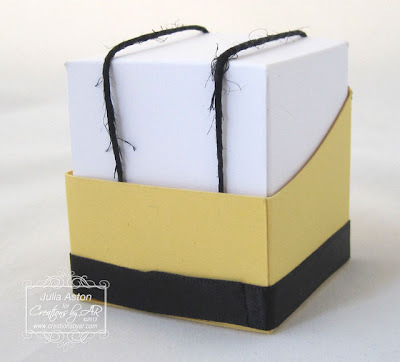 I used black jute for the straps and just taped each piece to the inside of the box and wrapped them around to the other side and taped them on the other side. This shows the top of the box lifted out of the gown piece. Here's how it looks from the back. (Do these spaghetti straps make my back look fat??!! LOL!!) The jute is a little feathery but it was the only thing I had in my stash that would work as a thin strap. (I tried cutting a satin ribbon and a velvet ribbon but they frayed!) I added a piece of black satin ribbon along the 'waist' of the dress. 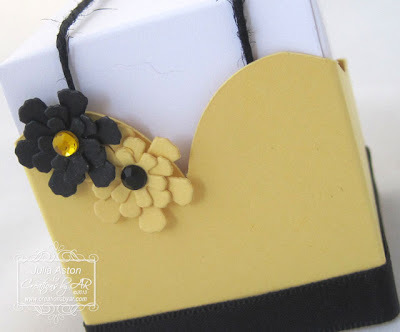 Accessories: glue pen, Scor Pal, Scor Tape, glue dots, red heart rhinestones - Michaels, black and yellow rhinestones - Kaiser Craft, black satin ribbon - May Arts, flowers - Primula Blossom Die/Memory Box, black hemp twine - from stash, Silhouette Cameo, Tux/Gown Template - Creations by AR. Happy Saturday everyone! 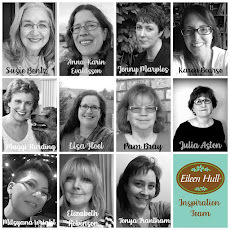 Today I'm participating in a fun blog hop with 4 of my blogging friends. 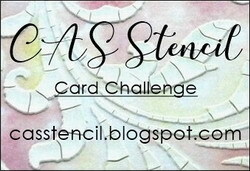 We're all showcasing a quick and easy way to make your own envelopes using a Kreate-a lope template! Kelly Schirmer organized the event after being contacted by Nick, the creator of the Kreate-a- lope, who asked her if she'd be interested in spreading the news about his creation to her crafting friends. The Kreate-a-lope allows you to make envelopes out of any kind of paper in seconds without scissors or tracing! You can use magazine pages, wrapping paper, calendars, maps, patterned papers ... etc, etc! At the end of my post you will find a link to a video made by the creator of the Kreate-a- lope and an opportunity for you to get one of your own with a pledge of $10.00. So I have a few pics on how I made my first envelope and then 2 other samples to show you. I used a long roll of kraft shipping paper that I purchased at Staples for all of my envelopes - the kind you might wrap packages in for mailing. I love the rustic home spun look and feel of it! First you lay the Kreate-a-lope template over the paper you are using. Then you just tear it away along all the edges. Note: this is a coarse weave paper and so it tears a little raggedly - but I think it adds to the rustic look! You could trim it with scissors if you didn't like that look! Place the center piece of the template into the center space, remove the outer template and fold up the edges around the center piece starting with the sides, then the bottom and top. Add glue along the bottom edges - I used Scotch Quick Dry Adhesive because - like it's name says - it dries quick! Before stamping the front of this envelope - I placed a mask of Eclipse tape over the center where I would want to write in the address. Then I stamped it using a text background stamp from Waltzingmouse. For my next envelope I used stamps from Vintage Garden - Seed Packet with Versafine Vintage Sepia ink - and again drew a border, this time around the edges of the envelope with a brown 01 Micron Pen. I would write my address inside the seed packet frame on this envelope. This would be a great envelope to send either a packet of seeds or a floral card to a garden loving friend! You can see the slightly irregular edges on the back of this envelope that I spoke of above - this coarse paper doesn't tear as cleanly as patterned paper or wrapping paper but I think it just adds to the character! For my final sample I used a Woodgrain stamp with Archival Coffee Ink. I again masked the center area for the address before stamping. 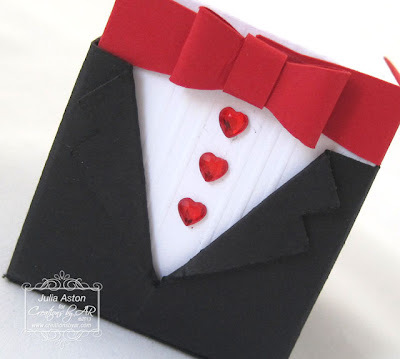 This would be a great envelope to send a 'guy' card in - with a hunting, camping, fishing, outdoors kind of theme! Nick is running a campaign at Kickstarter to raise funds to make the Kreate-a-Lope available in new sizes. For a donation of $10.00 you will help sponsor his project and also receive the current A2 size Kreate-a-lope like the one we are using today. Check out Nick Romer's Kickstarter Campaign here. There's also a video showing how easy the template is to use - sort of like my pics above but set to fun music! You will also find more templates at Green Sneakers.com. Now let's go see what kind of papers my blogging friends used for their home made envelopes! !